In this lesson, we will learn how to find an unknown length or scale factor when the areas are known or find an unknown area or scale factor when the lengths are known. Given the following figure, find the area of a similar polygon 𝐴 ′ 𝐵 ′ 𝐶 ′ 𝐷 ′ in which 𝐴 ′ 𝐵 ′ = 6 . Given the figure shown, determine the area of a similar polygon, 𝐴 ′ 𝐵 ′ 𝐶 ′ , in which 𝐴 ′ 𝐵 ′ = 3 . Given the graph, determine the area of similar polygon 𝐴 ′ 𝐵 ′ 𝐶 ′ 𝐷 ′ in which 𝐵 ′ 𝐶 ′ = 6 . Rectangle 𝑄 𝑅 𝑆 𝑇 is similar to rectangle 𝐽 𝐾 𝐿 𝑀 with their sides having a ratio of 8 ∶ 9 . If the dimensions of each rectangle are doubled, find the ratio of the areas of the larger rectangles. Two corresponding sides of two similar polygons have lengths of 54 and 57 centimetres. Given that the area of the smaller polygon is 324 cm2, determine the area of the bigger polygon. Two similar polygons have areas of 20 in2 and 80 in2. Find the scale factor of the first polygon to the second. 𝐴 𝐵 𝐶 𝐷 is a square where 𝐴 𝐵 , 𝐵 𝐶 , 𝐶 𝐷 , and 𝐷 𝐴 are divided by the points 𝑋 , 𝑌 , 𝑍 , and 𝐿 , respectively, by the ratio of 4 ∶ 1 . Find the ratio of the area of 𝑋 𝑌 𝑍 𝐿 to that of 𝐴 𝐵 𝐶 𝐷 . In the given figure, 𝐻 𝐴 𝐷 is an equilateral triangle with a perimeter of 45 cm. Given that 𝐴 𝐷 ∶ 𝐴 𝐵 = 3 ∶ 7 , determine the area of rectangle 𝐴 𝐵 𝐶 𝐷 . Using the figure below, find the ratio between the area of the parallelogram 𝑋 𝑌 𝑍 𝐿 and the area of the triangle 𝐴 𝐵 𝐶 in its simplest form. Given that 𝐴 𝐷 𝐷 𝐶 = 3 2 and the area of △ 𝐴 𝐵 𝐶 = 6 9 5 c m 2 , find the area of trapezium 𝐷 𝐶 𝐵 𝐸 . If △ 𝐴 𝐵 𝐶 ∼ △ 𝑋 𝑌 𝑍 and 𝐴 𝐵 = 9 5 𝑋 𝑌 , find a r e a o f a r e a o f 𝑋 𝑌 𝑍 𝐴 𝐵 𝐶 .
𝐴 𝐵 𝐶 𝐷 is a parallelogram with 𝐴 𝐵 = 9 and 𝐵 𝐶 = 5 . Let 𝑋 be a point on ray  𝐴 𝐵 but not on the segment 𝐴 𝐵 , with 𝐵 𝑋 = 1 8 . Let 𝑌 be a point on ray  𝐶 𝐵 but not on the segment 𝐶 𝐵 , with 𝐵 𝑌 = 1 0 . Let 𝑍 be a point so that 𝑋 𝐵 𝑌 𝑍 is a parallelogram. If the area of 𝐴 𝐵 𝐶 𝐷 is 39, what is the area of 𝑋 𝐵 𝑌 𝑍 ? Triangle 𝐴 𝐵 𝐶 is right angled at 𝐴 , where 𝐴 𝐵 = 2 0 and 𝐴 𝐶 = 2 1 . Suppose 𝐿 , 𝑀 , and 𝑁 are similar polygons on corresponding sides 𝐴 𝐵 , 𝐵 𝐶 , and 𝐴 𝐶 . If the area of 𝐿 is 145, what are the areas of 𝑀 and 𝑁 to the nearest hundredth? Two corresponding sides of two similar polygons have lengths of 44 and 76 centimetres. 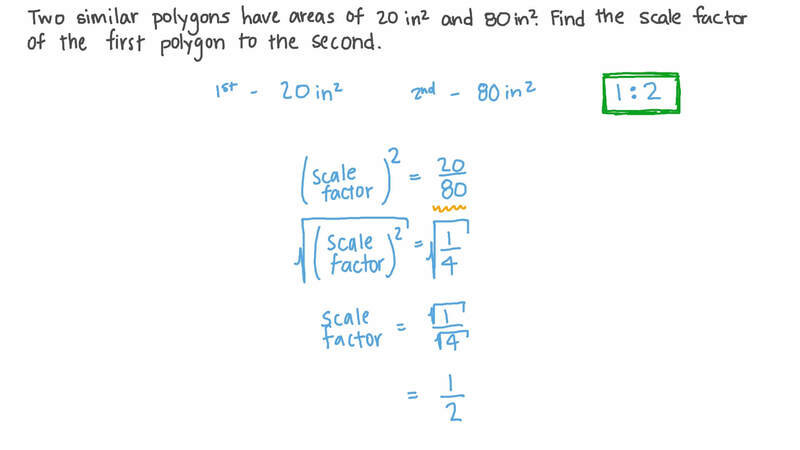 Given that the area of the smaller polygon is 121 cm2, determine the area of the bigger polygon. Given the following figure, find the area of a similar polygon 𝐴 ′ 𝐵 ′ 𝐶 ′ 𝐷 ′ in which 𝐴 ′ 𝐵 ′ = 9 . Given the following figure, find the area of a similar polygon 𝐴 ′ 𝐵 ′ 𝐶 ′ 𝐷 ′ in which 𝐴 ′ 𝐵 ′ = 3 . Given the following figure, find the area of a similar polygon 𝐴 ′ 𝐵 ′ 𝐶 ′ 𝐷 ′ in which 𝐴 ′ 𝐵 ′ = 2 . Rectangle 𝑄 𝑅 𝑆 𝑇 is similar to rectangle 𝐽 𝐾 𝐿 𝑀 with their sides having a ratio of 5 ∶ 3 . If the dimensions of each rectangle are tripled, find the ratio of the areas of the larger rectangles. Rectangle 𝑄 𝑅 𝑆 𝑇 is similar to rectangle 𝐽 𝐾 𝐿 𝑀 with their sides having a ratio of 9 ∶ 5 . If the dimensions of each rectangle are tripled, find the ratio of the areas of the larger rectangles. Rectangle 𝑄 𝑅 𝑆 𝑇 is similar to rectangle 𝐽 𝐾 𝐿 𝑀 with their sides having a ratio of 4 ∶ 7 . If the dimensions of each rectangle are doubled, find the ratio of the areas of the larger rectangles. Given the figure shown, determine the area of a similar polygon, 𝐴 ′ 𝐵 ′ 𝐶 ′ , in which 𝐴 ′ 𝐵 ′ = 6 .